I served this Thai beef curry to my family during our dinner and it makes me wonder how did I cook this dish because it was really good. To tell you the truth, I’m just an average cook and maybe I was lucky with this one. I’ll try it again next weekend and see if I can cook this Thai beef curry with the same taste and craving to have some more. Heat the oil in a flameproof casserole. Brown the beef in batches and set aside. Add the onions to the oil and cook for 5 minutes, then set aside with the beef. Add the curry paste and cook gently for 1 minute, stirring constantly. Stir in the tamarind paste, the fish sauce, coconut milk and sugar. Bring to boil, then reduce the heat and return the beef and onions to the casserole with the cardamom. Simmer gently, uncovered, for 1-1 1/2 hours, or until the meat is tender. Stir from time to time and if it is becoming dry, cover with a lid. Add the pineapple and cook for 5 more minutes. 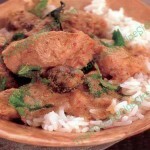 The curry should be quite dry, but add a little water if necessary. Then Serve with rice and prawn crackers. Ideas: Coconuts are one of the nutritious of all the fruits and visit www.ecoconutnutrition.com/coconut-juice-health-benefits.html">this site to know more about coconuts. 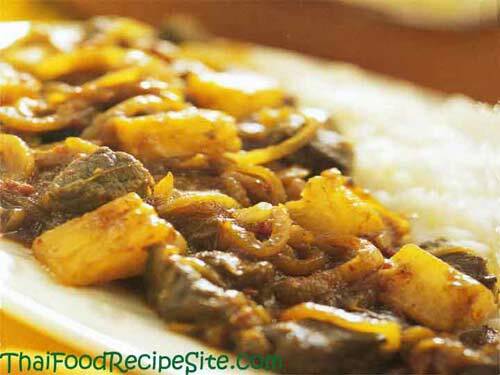 very delicious……….thai beef curry recipe…. Just cooked this for me and my girlfriend and have to say it is one of the best dishes we have ever tasted. Recommended greatly! 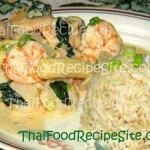 I’m glad that you and your girlfriend love this Thai Beef Recipe.